Offer available for purchases made between June 1 and 30, 2012, 11:59 MT. All purchases are non-refundable. Bonus miles will be awarded upon completion of the transaction. The maximum number of Buy and Gift Bonus miles that can be received by one member for this offer is 50,000 bonus miles. All miles purchased beyond this limit will not be eligible for a bonus. Offer is subject to change. Offer cannot be combined with any other offer. Share transactions are not eligible for bonus. Only purchases made online are eligible for the bonus. Miles are sold for $0.035 per mile plus a tax recovery charge of 7.5%. GST/HST will be charged to Canadian residents. 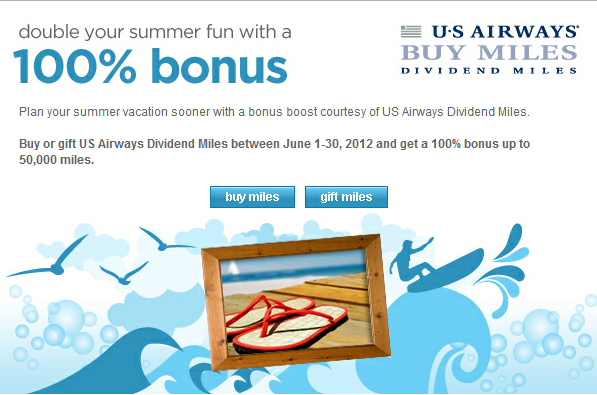 Miles purchased through Buy, Share or Gift Miles do not count towards Dividend Miles Preferred status. Miles may be used based on award availability at the time of booking. Please note that Dividend Miles accounts less than 12 days old are not permitted to Buy, Share or Gift Miles. All purchases are non-refundable.